The interior illustration is exemplary of the LUXOR model. 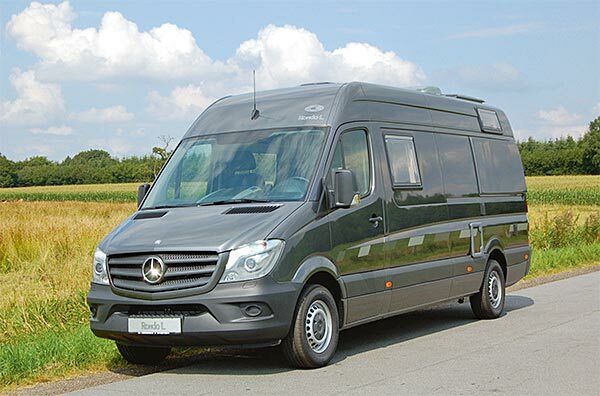 Our Rondo L is based on the Mercedes-Benz Sprinter, wheelbase 4.325 mm what makes a length of 6,94 m and a width of 2,02 m. The CDI engines start at a power of 120 kW/163 HP four cylinder. The top engine is a 3 l V6 CDI having 140 kW/190 HP. All engines are equipped with diesel particulate filters and measure up to Euro 6. A 6-gear-manual transmission is coming as standard, but also a 5-gear-automatic transmission is available for all engines. The essential safety equipment ESP as well as ABS, TCR and driver/passenger airbag come as standard. Also coming as standard are central locking with remote control, electrical windows, electrical and heated mirrors and heat-insulated glass in the driver's cabin. The further options are manifold from all-wheel drive to Xenon headlights. The Rondo L always is equipped with a special chassis version with stronger stabilizers and stronger shock absorbers to improve the driving safety. The gross vehicle weight is 3.500 kg so the Rondo L is subject to the legal requirements of cars. The Rondo L was developed for the customers who appreciate two single beds. The arrangement of the beds at right angles creates space in other parts of the vehicle. So the Rondo L stands out due to luxuriant bed measurements (85x190 cm across and 80x200 cm along) as well as to a very spacious seating area with a big window. The wet room is equipped with the usual cassette toilet, a pull-out sink and a lavish shower. The stowage in the closets and in the all round wall cupboards are very big. Conditioned by the disposal of the beds there is a huge storage compartment accessible through the back doors where camping table, -chairs and foldable bicycles or other leisure articles can be placed in. As typical for CS the whole cabinetry is made of 15mm poplar plywood with HPL-coating - also available as real wood veneer - made with massive wooden strips on all edges. The vehicle is insulated with 20 mm X-trem Isolator that is sticked all over the vehicle floor to ceiling. All windows and sunroofs are insulated and have blinds and mosquito nets. The cladding of the walls and ceiling as well as the upholstery is made with high quality microfiber that perfectly fits the high standard of CS camper vans. The technical equipment consits of a Truma Combi 6 (gas operated) for heating and boiling - as an option there also is a diesel operated version available. Also part of the technical equipment of the Rondo L are: a 90 l WAECO compressor fridge, covered sink and cooker (with electronic ignition), a boosted water supply with household-quality water taps, 100 l fresh water, 60 l waste water, 235 Ah board battery, 30 A charger and LED lighting all over the vehicle. The premium cabinetry can be personalized by a variety of decors but the vehicle furthermore can be customized with Corian sink or work tops, the complex developed folding table or also the massive wood window frames. There are even different possibilities to place monitors, satellite antennas and solar arrays. Also available are roof racks and ladders for transporting boats or surfboards. We also have transport facilities for bicycles or scooters on hand. The CS Rondo L is based on the Mercedes Sprinter with 4,325 mm wheelbase, making it 6.94 m lang, 2.02 m wide and 2. 70 m high. The CDI engines start with 4 cylinders and 95 kW/ 129 HP. An optional engine with 120 kW/163 HP is also available. Finally, the strongest possible engine the Rondo L can be equipped with is a 3.0 I V6 CDI engine with 140 kW/ 190 HP. All our vehicles come with particle filter and meet at least EURO 5bt orEUR06. A 6-gear-transmission is standard but a 7-gearautomatic (or 5-gear for four wheel drive) is also available. Essential safety equipment like a new generation of ESP, ABS, TCR, driver/passenger airbags and crosswind assist are just as much standard as a remote controlled central locking system, electric windows and heated, side mirrors as weil as heat insulated glass in the driver's cabin. The Iist of further optional equipment is lang and ranges from all-wheel-drive to all kind of assisting system to Xenon headlights. We deliver the Rondo L with a special chassis version with enhanced stabilizers and shock absorbers for even more safety while driving. The gross vehicle weight is 3,500 kg. The Rondo L was developed to resemble his younger brother, the Rondo. Both of them share the custom enlargements in the rear, allowing the bigger 195 cm x 150 cm bed to be installed. Due to the Ionger wheelbase the Rondo L not only has the standart cassettetoilet and retractable sink, but also a separate shower area. The amount of storage area in the surrounding cupboards and overhead lockers is very generous. Thanks to the way that the rear bed is placed, you also gain a very I arge storage area that can be accessed from the rear. This storage area can hold not only camping furniture, but foldable bikes and other recreational tools. The seating area is also much roomier thanks to the Ionger size of the Rondo L. The Isolation of the Rondo L consists of 20 mm X-trem isolator, which covers the walls from top to bottom. All windows and roof hatches are openable and come with insulated glass. The roof and wallpanelling is made from microfiber, as weil as high quality padded cloth, both meet the high quality Standard Of CS. The technical equipment consists of a Combi 4 heater and warm water heater made by Truma, alternatively available as a diesel version. lt also includes a 90 I compressor fridge made by WAECO, a covered sink and grill (with electric ignition), a water pressure system with high quality faucets, a 1 00 I freshwater tank, an 80 I waste-water tank, a 235 Ah gel battery, acharger with 30 Apower as weil as a complete set of LED-Iights. The design of the furniture can be chosen from a wide selection of different materials and decors to create a unique vehicle. Costumisation isn't limited to the furniture; the kitchen sink and the working surface made of Corian offer a similar selection of designs. This, plus the carefully built folding table and even real wood window frames, allow each vehicle to be built to the customers wish. We also offer clever solutions for storing monitors, satellite dishes as weil as solar systems. A roof rack with rear ladder allows the vehicle to carry boats or surfboards. Transporting bicycles or motorcycles is also possible. Our production creates a unique Rondo L just as the customer wishes.